How to check system performance? Is there a way to measure the performance of 3D acceleration, java applets, firefox scrolling etc. with a tool and compare it with lets say a windows OS or other users having almost the same hardware? Maybe it is a setup issue where some fundamental drivers are missing or something? Even when this question is related to software issues you may wish to give a try to HardInfo, System profiler and benchmark, which will allow you to perform several benchmarks in order to gather information of your system and allows you to perform comparisons with other systems. Linux should run with a considerable ease, the applications that you refer, unless the hardware is reaching its limits. Most of the times a big memory size isn't enough if the memory speed doesn't fit your need for speed. Hard disk drives should be fast enough and facing no issues and generally: The system should be in good condition. You don't lose anything giving this a try and may find something that would give you an idea of how is your system handling the physical resources. 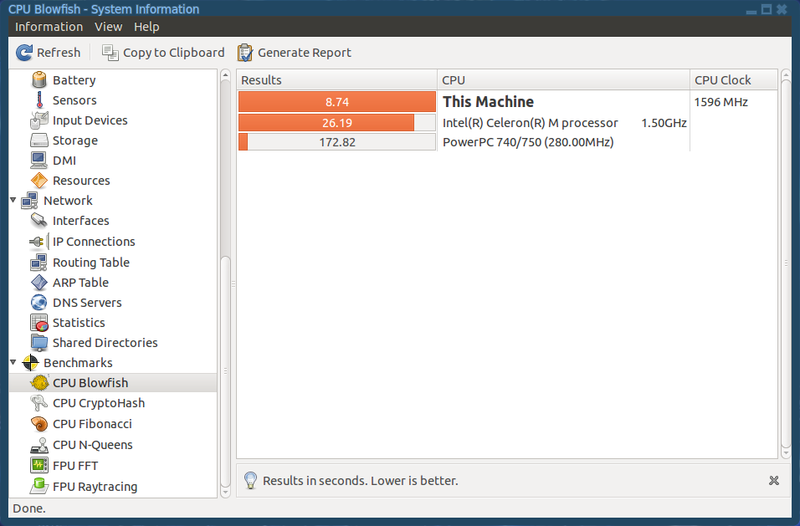 Here is a screenshot of my CPU Blowfish benchmark with two comparisons. Additionally you can use a system monitor tool, like Conky or GkrellM in order to see your system's performance when attempting to run one of these applications. This won't fix your issues but will give you a clue on where to start. And when writing all this stuff I got a bulb turned on over my head, and I think that you should check what running processes are giving you problems when attempting to do what you wish. I mean: there can be a running process which can be requesting lots of processor or memory and this can cause your other applications to have problems. Check this out in System Monitor: System/Administration/System Monitor. In the next screenshot you can see my google chrome demanding 122 MiB of the physical memory. Who knows? you try it and let's see what happen. The more information you gather, the easier to find the solution. I am afraid, what you are facing is typical of Linux systems, and linux itself is not to blame for this. I would try to answer this one-by-one. Java is notoriously slow on many systems. Even on windows, where it is heavily optimised, performance is dismal. 64 bit java is very messy. Yes the comparison is very much unfair, as you are running a pure windows game using an emulator. I am sure running a native linux game with a proprietary driver will give a good result. 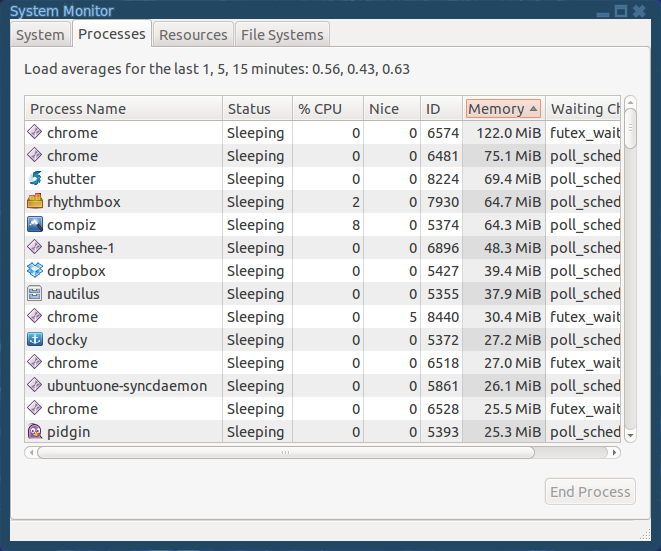 For measuring system performance, Try the phoronix test suite, which is choc full of tools for benchmarking. Considering the lag in scrolling in Firefox my first guess is that you lack the necessary drivers for your graphics card. You should try from the menu System -> Administration -> Additional Drivers. And check if there is anything for you. to find out which vm is installed in your computer. Try installing the sun-java6-jre. My scrolling problems with Firefox disappeared when I disabled Firefox Sync, and went with the bindwood sync from Ubuntu! If you have both Bindwood and Firefox Sync enabled at the same time it causes all kinds of problems. How do I measure performance of a virtual server? How do Ubuntu flavors compare regarding resource consumption and performance? Desktop performance issues on laptop - how to find the reason?